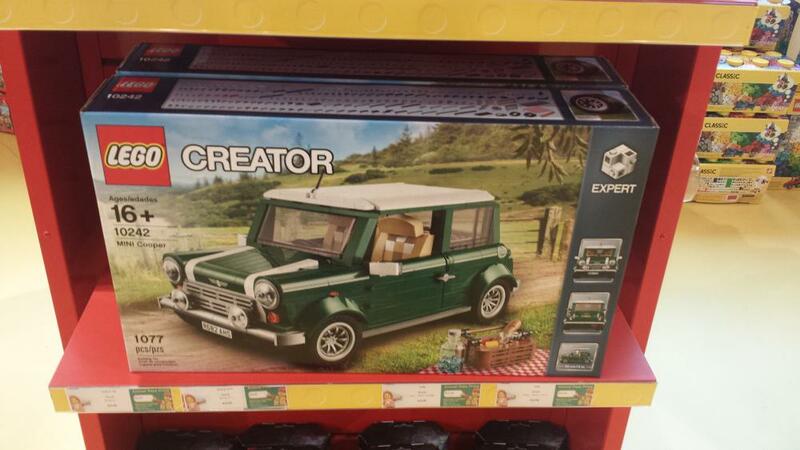 Earlier this year, LEGO began to update the retail box designs for their Creator Expert theme of sets. This has become a talking point among many LEGO collectors and investors who have been wondering what exactly this means, and how it may affect the retirement dates of particular sets. The new logo is made up of six 1×1 angular bricks arranged in a continuously connecting pattern reminiscent of a LEGO MC Escher painting. The new logo made its debut with the release of 2015’s 10248 Ferrari F40 and has since unified the Creator Expert lineup box logos… almost. A mass redesign of boxes for available sets is an unprecedented move by LEGO, so nobody knows for certain what exactly the meaning is behind this move, but reasonable deductions can possibly be inferred from it. As of late 2015, there are currently four modular buildings available for sale, with a new one — 10251 Brick Bank — set to be released in January 2016. LEGO has introduced one new modular building each year, and they generally retire one each year as well, with the oldest available one always retiring first. Earlier this year, we wrote an analysis of why the Pet Shop is likely retiring soon, and the latest Creator Expert box updates support that, as you will see below. So what do these box redesigns tell us about the modular buildings series? Well, the simplest conclusion to draw is that the Palace Cinema, Parisian Restaurant, and Detective’s Office are here to stay and the Pet Shop is likely retiring soon. After all, why would LEGO update the boxes of sets just to retire them immediately after? And similarly, why would the Pet Shop be the lone modular using an old box design? The plot thickens when we examine the landmarks sets in the Creator Expert lineup. There are currently two available sets in this sub-theme, the five year old 10214 Tower Bridge, and the much younger, two year old 10234 Sydney Opera House. This is more of a surprise, as we see the Tower Bridge has received a box redesign after five years of availability, and the comparatively much younger Sydney Opera House has not received the updated Creator Expert logo. This indicates two potentially big surprises: The Tower Bridge may have some life left, and the Sydney Opera House could possibly be up for retirement in the near future. The vehicles sub-theme of the Creator Expert lineup has seen box redesigns for all of the older sets and the entire collection now features the new Creator Expert logo that was introduced on the Ferrari F40 box. The only surprise here is that 2011’s Volkswagen T1 Camper Van was given the redesigned box treatment. It has been widely expected that this set would retire soon, and it still may, but an updated box does potentially indicate that there is still some time left on that set before it retires. So what can we conclude from this information, where we see some sets getting new, updated boxes and other sets continuing to use old boxes without the new Creator Expert logo? For the modular buildings collection, the box changes reinforce what we already suspected: 10218 Pet Shop is likely the next modular to retire. For the vehicles and landmarks lineups, we may expect 10220 Volkswagen T1 Camper Van and 10214 Tower Bridge to live on a bit longer, although any set that is as old as those sets should be considered at some risk of retirement. The biggest piece of information that could possibly be inferred from these box changes, however, is that 10234 Sydney Opera House could be a surprise candidate for early retirement. It’s difficult to know for certain if that will be the case, but that would be a huge, massively unexpected move that would catch many collectors and investors off-guard. In the recent past, large sets that retired unexpectedly, such as 10224 Town Hall experienced large, immediate gains in value. Could 10234 Sydney Opera House be the next set to do just that? That Pet Shop didn’t get a box redesign is not surprising anyone I’d guess. But the real surprise is the SOH -not- getting a box redesign. Will be interesting to see the value of this set going up once it gets officially retired! I think that the Mini Cooper 10242 maybey also not a redesigned box is. This is a box from 2014, but not the end of 2015 redisigned box. They has aslo no last updated box. Is this means, that possibly the Camper Van has still time to go, with a new redisigned box, and the Mini Cooper 10242 next year will be sold out first? Like first the 10234 Sydney Opera House going first quickly sold out and not the 10214 Tower Bridge. And the new 10253 Big Ben Creator Expert for 2016, confirm that one of the 10214 or 10234 is sold out soon, whit the 10234 first, because they has no new redisigned box.